SAP Business One has been specifically developed for SME's and it's currently being used at over 60,000 companies by one million users worldwide. SAP B1's global popularity comes from its ability to manage all aspects of an organisation in one single software system. 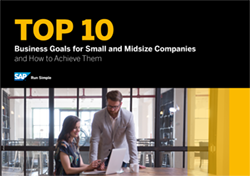 Companies like yours have big goals. But it’s easy to lose focus when day-to-day issues demand your immediate attention. It’s also easy to forget the “big picture” when data lives in different locations. On top of this, disjointed sales, accounting and operational processes can also create bottlenecks and reduce productivity. It's important you have a clear view of your whole business to stay competitive. SAP Business One will streamline your processes and help you find better ways of working. It'll give you instant access to whatever information you need, which will mean you can make the best decisions possible. SAP Business One can help your company see clearly, think clearly and act clearly. It'll help you close the gap between strategy and execution and become a best-run business. It's been designed to be flexible, and whether onsite or cloud based, it can be accesed both from your desk or on the road. Plus, because SAP Business One runs on both the SAP HANA® and SQL, you can choose the one that’s best for your business. What’s more, your employees can start using it from day one. Then, as your business grows, it grows with you to meet your needs. SAP Business One will integrate your whole business in one system. This means you aren't using multiple spreadsheets across your company, which removes the worry of duplicate data entry, costs and errors. Automatic alerts make sure you know when important events occur so you can focus on the most critical issues. SAP Business One gives you a clear view into how your business is performing, which gives you greater confidence in the information you're using to make decisions. Together with the fully integrated Crystal Reports software, SAP Business One has dashboards and reports will provide insight into all business areas. Information can be easily drilled into so you can get answers to your most urgent questions. This also means customer needs can be responded to quicker than ever before. While revenue, costs and cash flows can be tracked to assess performance and take quick corrective action. You can put SAP Business One to work straight away by just using the parts your company currently needs. Then, you can switch on extra modules as the system grows and develops with you. You can also use the SAP Business One studio, software development kit, or the Ochiba OPTIONS range to enhance it even further to meet your specific needs. SAP Business One is a single system which manages your entire business. It automates processes to improve efficiency and gives you all the information needed to make the best possible decisions. With a clear view of your whole company you can gain greater control over your business. It will help you see who your best customers are and serve them better. The Ochiba OPTIONS range enhances SAP Business One's Core Modules to meet your businesses specific requirements. Discover SAP B1 and find out why it's the world's leading business management system for SME's. Sign up for a free 30 minute online demo. Or call 0114 299 9430 to talk to one of our SAP Business One experts. After 30 years of R&D, SAP released SAP HANA. It's development has 'reinvented' the database. The advances in SAP HANA mean operations can be 10-1000x faster than a traditional database. With simpler design and operations it allows applications to be built that weren't possible before. SAP HANA also removes the need for separate and multiple Servers, Data Stores, Datamarts and BI Tools. Call 0114 299 9430 to find out how SAP HANA will revolutionise your SAP Business One. SAP Business One Cloud provides all the advantages of SAP Business One plus the benefits of the cloud. It has the flexibility to start small and grow alongside your business. TSAP Business One Cloud is provided as a service, so you don’t need to hire experienced IT staff to manage and support your software and its infrastructure. Call 0114 299 9430 to discover how SAP Business One Cloud can benefit your company. SAP Lumira quickly combines data from different places to uncover hidden insights. Designed to be easy to use, it helps you quickly manipulate your data. You can then analyse the information using the built in graphics to gain a full picture. SAP Lumia helps you quickly discover valuable insights that were hidden before - without scripts, queries or reports.